Dippity Do – Fun With Easter Eggs (Bonus Easter Article) | What's Cooking at the Genua's? Easter is just about here and one of the fun activities to partake in this and every Easter season is to color Easter eggs. Easter eggs are easy and enjoyable to color; you just need to abide by the following hints. 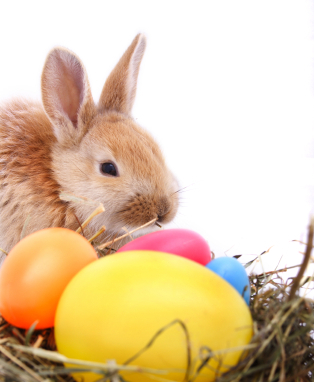 Easter eggs generally start with hard-boiled eggs, so purchase one dozen or two for coloring. Gently lower them in boiling water for about 10 minutes. The eggs will cook and become hard-boiled. Now just let them dry. The most convenient way to color your Easter eggs is to acquire an Easter egg decorating kit. These kits generally include dyes to paint your Easter eggs several colors, templates or stickers to adorn and design them, and an Easter egg holder to easily allow them to dry. Most kits only cost a few dollars and are extremely practical. You can also prepare your own colored dye. You can mix about 1 tbsp. of food coloring with a half tsp. of vinegar, then add about 1/2 cup to a third cup of water. Now just soak your Easter egg into the colored cup of water. The longer your egg sits in the water, usually the deeper and darker the color. Moreover you can hand paint your Easter eggs. You can find many water-color paints or other types of paints to design and decorate your eggs. Even undiluted food coloring usually works. It is important to note that you shouldn’t eat any eggs that you have used paint on. Designing or decorating your egg is fun and easy as well. Once the eggs are hard-boiled, you can secure stickers to the egg, use a brush to carefully coat a creative design, or glue construction paper cut outs to your egg. Some people even dress their Easter eggs up with doll or handmade clothing made from wool or other kinds of fabrics. This article is available for reprint – Please read our terms and guidelines for more information. **I obviously didn’t write this article but it’s a good one. I will be posting similar articles to help us out in the kitchen or with cooking. Thanks!